Mix warm water, matcha green tea powder and sugar into a mug until it becomes a smooth green paste. Froth the milk and half into the mug. Mix the paste and milk together. Pour the remaining foaming milk. Top with matcha powder. 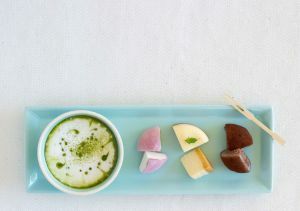 Serve this latte with pieces of yuzu cheesecake, chocolat nama daifuku and sakura ice cream mochi.